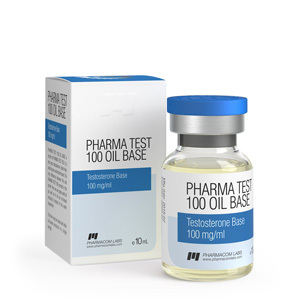 The basis of PHARMA TEST OIL BASE 100 is the male synthetic hormone, dissolved in oil. The drug from the company PHARMACOM LABS has a strong effect on the body, commensurate with the work of endogenous testosterone. Actually, the differences between the natural and artificial hormones consist solely in the period of exposure to the body. Although the price of testosterone suspension is not high, lovers rarely use this drug, since it must be administered daily. If you decide to buy a testosterone suspension, then remember that there is no ester chain in the preparation. This allows the steroid to quickly enter into work, but its activity is rather transient. In its effects on the body of an athlete, this steroid is as close as possible to propionate. Very often pro-builders, namely they are the main consumers of the male hormone suspension, inject the drug twice a day. Thanks to this anabolic can significantly increase the physical parameters, gain weight and speed up the recovery of the body. In addition, the muscles acquire a beautiful relief. Unfortunately, the injections are quite painful, although not so much as with the introduction of an aqueous suspension. Like any testosterone-based AAS, Farmakom Labs product is aromatic. It is obvious that girls can not use it, so as not to cause virilization. The drug is quickly included in the work and during the day excreted from the body. This requires athletes to give injections every day or even twice a day. We have already noted the fact that injections are quite painful and many builders use nimesulide or its analogs to reduce pain. The daily dose of a steroid is 50-100 milligrams. We do not recommend exceeding the dosage, as the drug suppresses the activity of the pituitary arc sufficiently strongly. Testosterone suspension course is carried out for a maximum of five weeks, which is largely due to the painful pricks. At the same time, with longer use of the steroid, it is necessary to use gonadotropin to support the work of the testicles. You can use a testosterone suspension in combination with any AAS.